Our Coastal and Environmental Initiatives range from outreach to schools in St. Bernard to prepare students for jobs in the growing field of coastal restoration to engaging stakeholders in efforts to protect the coast and respects the way of life in St. Bernard. CTE program in partnership with Chalmette High and Nunez Community College. Blaise Pezold gazed out of his office window at a massive cargo ship plying downriver, eclipsing the entire wall-to-wall span of glass in the aptly-named Arlene Meraux River Observation Center. “The water is everywhere around us. It’s our lifeblood, but it’s also a major threat,” he explained as he turned his attention back to his computer. Typical for any office, his desk is cluttered with papers and files, but mixed in was a tray of seeds, maps, and a miniature greenhouse. Pezold was preparing for a trip upriver to the headwaters of the Mississippi in Minnesota where he would be working with colleagues and educators to promote “one river thinking.” Before that, though, he had plans for a large crop of Arundinaria gigantea, commonly known as river cane, that he was intent on planting on the soggy batture before his flight. Pezold joined the Meraux Foundation last fall as Coastal and Environmental Program Manager to spearhead the nonprofit’s ever-expanding plans to protect, preserve, and restore St. Bernard Parish’s rapidly disappearing coast. Saving the coast may be a Sisyphean task, with a report released this year by Tulane University concluding that Louisiana will not be able to build land fast enough to keep up with how quickly wetlands are disappearing. The rapid, devastating land loss is the result of a variety of factors, including saltwater intrusion, subsidence, and man-made disturbances. Image: Louisiana Coastal Protection and Restoration Authority. The magnitude of the task hasn’t checked Pezold’s ambitions, though. He’s focused his long-term plans on working with local, state, and federal partners to maximize the impact of RESTORE Act funds in St. Bernard Parish. The funds come from penalties related to the Deepwater Horizon spill and are dedicated to environmental restoration and protection projects. 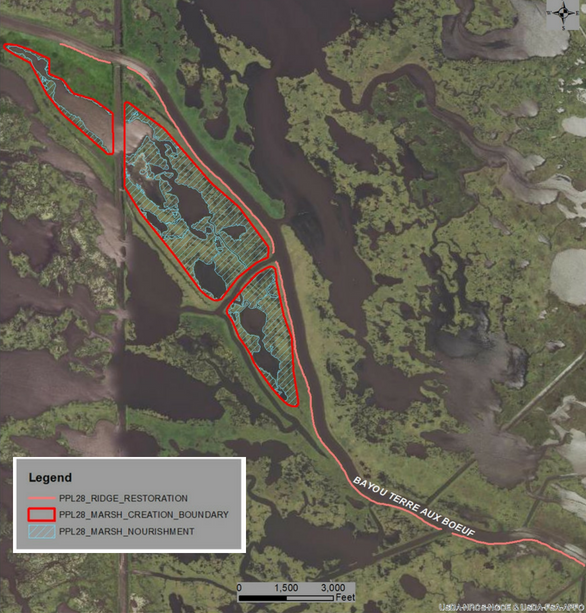 With sights set on large-scale restoration efforts, Pezold coordinated the Meraux Foundation’s partnership with St. Bernard and Plaquemines Parish Governments to design a $25 million restoration and marsh creation project for the Bayou Terre aux Boeuf Ridge that is being considered for Coastal Wetlands Planning, Protection and Restoration Act (CWPPRA) funding. The USDA National Resources Conservation Service is the sponsoring agency for the project. 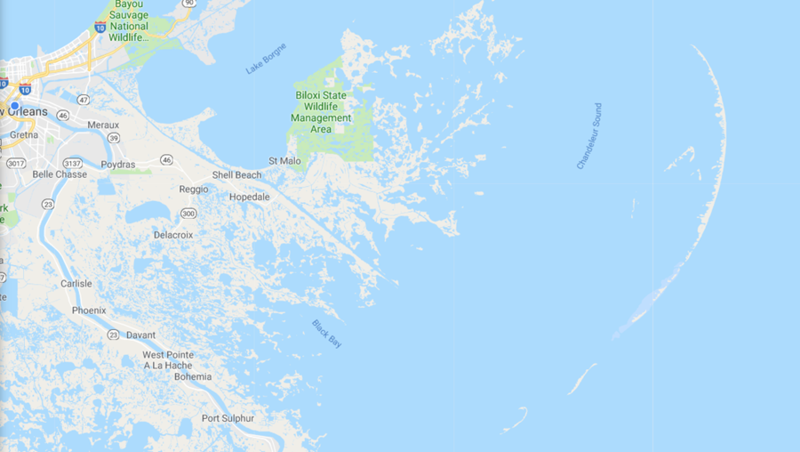 The Meraux Foundation is also partnering with the St. Bernard Parish Coastal Division and others on a proposal to protect and restore the Chandeleur Islands, one of the most critical coastal land formations in Louisiana. The $2.5 million project includes a sand fence and 10 different vegetation types to enhance the resilience of the barrier islands and sustain their ecological and physical functionality. Also in Chandeleur Sound, the Meraux Foundation is coordinating with Nunez Community College and other organizations to create a “Living Shoreline” demonstration project. Meraux Foundation Board Members Bill and Chris Haines worked with Pezold to design a small, lightweight oyster reef unit prototype that is now being manufactured by Chalmette High School students in the Career Technical Education program. 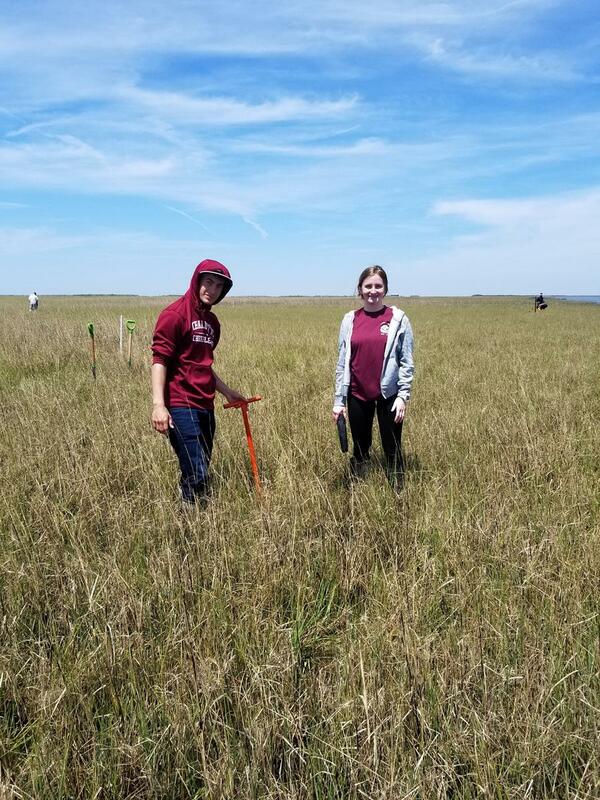 The student-built units are being deployed along the coastal fringe marsh to stimulate oyster growth, creating a living shoreline to reduce coastal erosion. Oyster reefs built by Chalmette High School students will be placed along an area of shoreline of Chandeleur Sound to reduce marsh erosion. “The Living Shoreline project is a win on so many levels. We’re creating practical solutions to reduce coastal erosion, and we’re engaging students who are gaining real-world experience, learning technical skills, and earning course credits,” said Pezold. With education as one of the Meraux Foundation’s five core program areas, Pezold often creates opportunities for student involvement in the nonprofit’s environmental activities. For two years the Meraux Foundation has partnered with Chalmette High’s 4-H Club and a dozen other partner organizations on a St. Bernard Parish Coastal Division-led project to collect Black Mangrove propagules, raise them into trees, and plant them in the Biloxi Marsh. So far this year, the group has planted 1,275 trees, restoring six acres of land. The Black Mangroves, along with other plants used for coastal restoration, are being grown in the Meraux Foundation’s new greenhouse on its Docville Farm campus in Violet. In addition to raising plants, the greenhouse serves as a learning resource for K-12 students throughout the year. It has become a highlight of AgMagic on the River, an annual event the Meraux Foundation hosts to link Louisiana’s agriculture and environment with people’s everyday lives. “We continue to build out Docville Farm so that it can better meet the needs of the community. Beyond hosting events and providing space for community dialogue, the farm is a hub for positive growth — now both literally and figuratively!” said Gue. 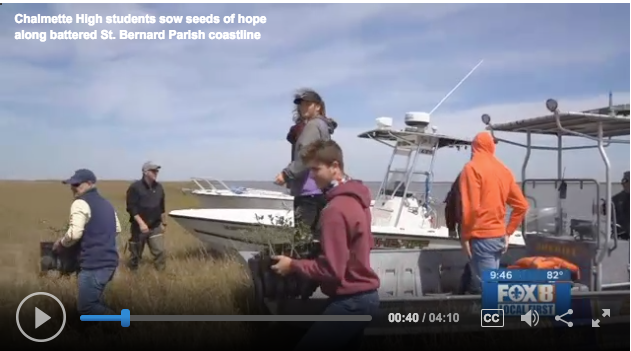 WVUE Fox 8 News report on the Black Mangrove planting with Chalmette High students. The Meraux Foundation is currently planning a reforestation project for the Central Wetlands, the area between the 40 Arpent Canal and the Mississippi River-Gulf Outlet, in partnership with several agencies and environmental organizations. The Meraux Foundation has five core program areas, and Pezold includes aspects of each in the nonprofit’s Environmental and Coastal Initiatives.